I’ve got a great giveaway for you today – a copy of the latest in Tim Weaver’s David Raker series. If you haven’t read any of them before – and I hadn’t – you need to know that David Raker is an investigator looking into missing people cases. I was really fascinated by the concept that the person missing in this book wasn’t really missing at all. What was missing was his entire memory of who he actually was and this was the challenge for Raker – discover who ‘The Lost Man’ really was and why no-one seemed to know him when appeals were made in the media. The idea that without a fixed identity you really were no-one was really interesting to me. With no proof of who he was Richard couldn’t get a National Insurance number and therefore couldn’t work, couldn’t access the NHS, couldn’t get a passport – so many things that we take for granted. When Raker started investigating, the plot took so many really dark twists that I couldn’t possibly have imagined! 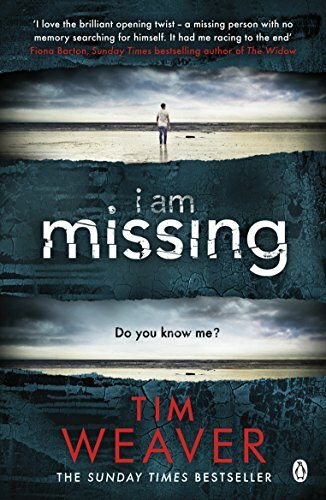 I Am Missing is published by Michael Joseph Books today, Thursday 27th July. If you’re not lucky enough to win my giveaway, you can order a copy online here and it will, of course, be available in all good bookshops. If this sounds like the kind of book you would like to read, then enter my giveaway by clicking the link below. It’s open to UK residents only and you have until midnight on Saturday to enter. I’ll contact the winner within 24 hours and your prize will be sent directly from the publishers. When a young man wakes up bruised and beaten, with no memory of who he is or where he came from, the press immediately dub him ‘The Lost Man’. Naming himself Richard Kite, he spends the next ten months desperately trying to find out who he is. But despite media appeals and the efforts of the police, no one knows him. Richard’s last hope may be private investigator David Raker – a seasoned locator of missing people. But Raker has more questions than answers. Why does no one know him? And what links him to the body of a woman found beside a London railway line two years ago? Could Richard be responsible for her death – or is he next? What I’ve been reading this summer is nowhere near enough! I need to find my missing mojo. I’ve read and enjoyed previous books in this series and this looks good. Thank you for the giveaway. I’m currently reading Another Woman’s Husband by Gill Paul and loving it.